As Bomberman exploded onto the gaming scene in the ‘80s, players around the world got down to the business of blasting through walls—and, later, their friends—for freedom, glory, and good old destructive fun. No matter how many Power Bombs you’ve laid down, though, there are a few hidden gems about the early years of the mini bomber and his complex universe that you might have missed in the rubble. 1. BEFORE HE WAS A ROBOT, BOMBERMAN WAS A MAN IN A BOWLER HAT. Six years before Bomberman stormed U.S. shores via Nintendo Entertainment System in 1989, the earliest version of the game was launched for a variety of popular computer systems. In Bomberman’s home country of Japan, Bakudan Otoko featured the character’s earliest manifestation, while in the U.K. players blasted their way to the surface in Eric and the Floaters. Spanish gamers did the same with Don Pepe y Los Globos. is a robot engaged in the production of bombs. Like his fellow robots, he had been put to work in an underground compound by evil forces. Bomberman found it to be an unbearably dreary existence. One day, he heard an encouraging rumor. According to the rumor, any robot that could escape the underground compound and make it to the surface could become human. Bomberman leaped at the opportunity, but escape proved to be no small task. After a U.S. player beats the game’s 50th level, Bomberman is indeed rewarded by being turned into a human. At the end of the Japanese NES game, Bomberman turns into a human character named Runner, better known to gamers as the hero of Lode Runner, a title that Bomberman production company Hudson Soft ported for the NES. 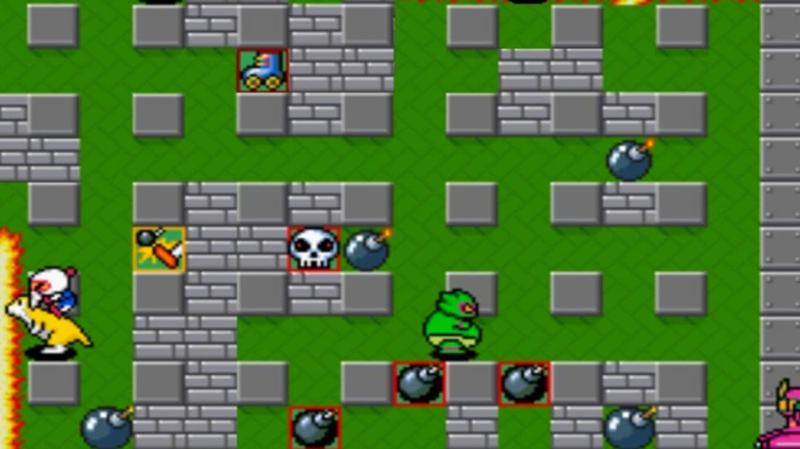 The implication of this transformation, according to many gamers, is that Bomberman serves as a prequel to and "origin story" for Lode Runner (though Bomberman’s character saga continues with his own franchise, too). 5. AS A HUMAN, BOMBERMAN HAS TO BREAK OUT OF PRISON, FIGHT CYBORGS, COMBAT HIS DOPPELGANGER, AND (A LOT) MORE. Sadly, becoming human only leads to more problems for Bomberman. In the 12 years between Bomberman’s 1983 Japanese and European debut and the 1995 worldwide release of Super Bomberman 3, the series’ last U.S. title for the Super Nintendo Entertainment System (SNES), his life as a surface-dweller got pretty complicated. In Bomberman II for NES, for example, our white-clad hero (a.k.a. Bomberman Shiro) interrupts a bank robbery by a black-clad bomber (a.k.a. Bomberman Kuro), ends up getting framed for the deed when he’s found next to the loot, and spends the rest of the game trying to blast his way out of prison in order to set things right. With Bomberman ‘93 for PC, the White Bomberman had to recover seven power circuits that the Black Bomberman had stolen from a city—rendering it helpless—and scattered throughout the galaxy. And in Bomberman ‘94 for PC, things got even worse: Bagular and his evil robot army split the Spirit Pictures, a set of objects that had previously allowed five magical beings to protect Bomberman’s home planet, resulting in the planet itself splitting into five pieces. The mayhem reached new heights for Bomberman in Super Bomberman, Super Bomberman 2, and Super Bomberman 3 for SNES, culminating with the hero having to reverse an alien invasion of Earth. 6. THE VERSION OF THE GAME FOR NES/FAMICOM WAS MADE IN JUST 72 HOURS. The title that solidified the evil-disrupting robot and aspiring human’s fame around the world—Bomberman for NES and Famicom—was reportedly ported from the 3D version in a three-day marathon session by the game’s creator, Shinichi Nakamoto. He ran out of gum while programming, so he started chewing on pencils instead. 7. DESPITE THE GAME’S EXPLOSIVE PREMISE, ITS MAKERS HAD SAFETY IN MIND. 8. THERE WAS A BOMBERMAN TV SHOW (WITH YET ANOTHER NEW PREMISE). In 2002, the Japanese cartoon Bomberman Jetters gave the character a new backstory, new allies, and a long list of new challenges. After taking over his older brother’s spot in the intergalactic crime-fighting crew The Jetters, White Bomber (or Shirobon) works with the team to foil the thieving Doctor Mechadoc and Mujoe and their Hige-Hige Bandits, plus a lot of other one-off foes. As the series continued, serious personal plots came into play, such as White Bomber’s search for the truth about the fate of his older brother and storylines on how series villains first joined forces. In 2002, a game based on the show (itself based on earlier games) was released in Japan for the Nintendo GameCube and PlayStation 2. This game made its way to the U.S. for GameCube in 2004. 9. THERE ARE ALMOST A HUNDRED BOMBERMAN GAMES. Including games in the main Bomberman franchise, portable and mobile games, and spin-offs, there are estimated to be over 92 Bomberman games to date, with 34 released for Nintendo platforms alone. In total, the franchise has sold over 10 million game units—putting it in the same league as the Deer Hunter franchise. 10. ALAS, U.S. PLAYERS HAVEN’T GOTTEN TO SEE MANY OF THEM. After early versions of the game first hit Japanese and European markets in 1983, it took six years for Bomberman to reach U.S. shores on the NES. Tragically, Bomberman deprivation for American fans didn’t end there: titles such as Bomberman Land 1, 2 and 3, Super Bomberman 4 and 5, Bomberman ‘94, Bomberman Wars, Saturn Bomberman Fight! !, and Bomberman: Bakufuu Sentai Bombermen were only released in Japan, while others made it from Hudson Soft’s Japan headquarters to European stores but not all the way to U.S. ones. 11. A NEW BOMBERMAN LAUNCHED IN 2014 FOR ANDROID AND IOS … BUT ONLY IN JAPAN. The newest iteration of the game features Single Battle and connected multiplayer Battle With Everyone action, and is available via the Google Play Store and iTunes App Store. For now, though, the new Bomberman is only available to players in Japan; players in other countries will just have to wait and hope (or start a petition).